Charged GBH are an English Street punk band, formed in 1978 by vocalist Colin Abrahall, guitarist Colin "Jock" Blyth, bassist Sean McCarthy and Drummer Andy " Wilf" Williams. GBH were early pioneers of English street punk, often nicknamed "UK82", along with Discharge, Broken Bones, The Exploited and The Varukers. They have gone on to influence several punk rock musicians. The name GBH was inspired by then-bassist Sean McCarthy's trial for grievous bodily harm. Charged GBH embarked on several English and mainland US tours during the early 1980s, including several gigs at the 100 Club. 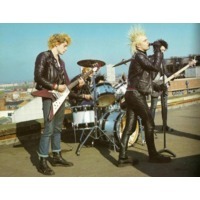 1982 saw GBH's first LP, City Baby Attacked By Rats. Lyrically, the album dealt with criticism of British and European culture, violence, morbidity (especially in reference to the song "Passenger On The Menu", which describes in graphic detail the experiences of the passengers on the Uruguayan Air Force Flight 571), atheism, nihilism and humour. Musically, the album was loud and fast, with few songs exceeding three minutes. In 1984 the band changed their name to GBH (grievous bodily harm). Unlike some early punk bands that evolved towards other styles, GBH have stayed fairly faithful to their original UK82 sound in subsequent releases. Their peers like The Exploited, Picture Frame Seduction, Discharge and The Varukers have all enjoyed resounding success in the USA and fit the genre' UK82 punk rock. However, the band have experimented to some degree with a more speed metal-inflected sound, notably with their 1992 release Church of the Truly Warped, although they have since returned to a more purist punk sound. The band is still active and touring and maintain a strong following both in England and the rest of Europe, as well as in United States and Japan.